Tolomatic high-force electric actuators are more efficient, accurate and flexible compared to hydraulic cylinders--and without the messy leaks or noisy operation of hydraulics. high-force electric actuators—is an economical actuator solution with forces up to 18,000 lbf (80 kN) ideal for replacing hydraulic cylinders. Designed and tested for 100% duty cycle, the RSX080 actuator is roller-screw driven for long, consistent life in demanding environments. Applications include pressing, punching, stamping, riveting, fastening, joining, injection molding, and sawmilling. In addition to the RSX080, Tolomatic high-force linear actuator solutions include the RSX096 actuator (30,000 lbf; 130 kN). The heavy duty construction of both models includes tie rods and Type III hard-coat anodized aluminum or zinc-plated steel. A standard anti-rotate feature prevents the rod from rotating without external guidance. Rated IP65 with an IP67 option, the actuator resists water from a light washdown and dust from outdoor environments. The RSX actuator is also designed and rated for extreme conditions including cold-weather operation. A food-grade version, designed for volumetric filling and other high-force food-and-beverage applications, is made of 316 stainless steel and food-grade white epoxy to meet USDA specifications. applications, but at a reduced force and cost to meet specification needs,” said Aaron Dietrich, Director of Marketing, Tolomatic. frame size. Additional features include an access port for re-lubrication to maximize service life and a breather/purge port to prevent ingress into the actuator. RSX actuators are built-to-order and shipped with an industry leading 4-week delivery schedule. 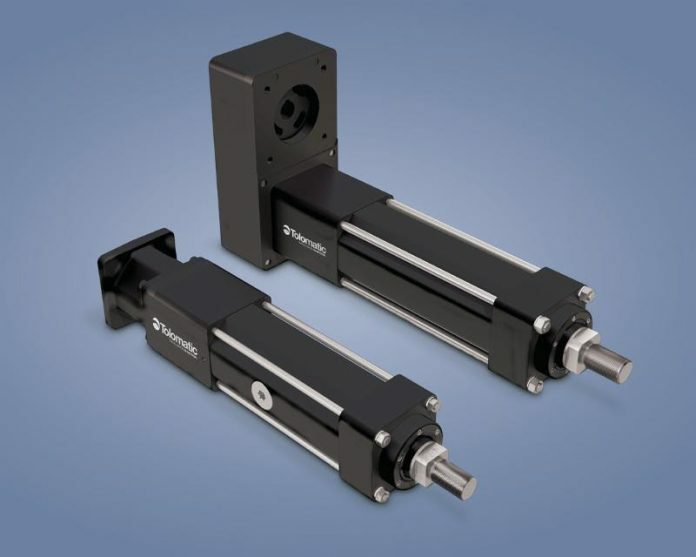 product line also includes servo-driven high-thrust actuators, servo motors and stepper motors, stepper drives and configured linear-motion systems. Tolomatic’s electric linear and pneumatic actuators are used in a variety of industries, including the packaging, material handling, medical, food processing, automotive, semiconductor and general automation industries. Epic Games showcase Lightworks SLIPSTREAM and Hackrod at Build: Munich.